Deserts are areas of the world that are extremely dry. They don't get much rain. Officially a desert is an area that gets less than 10 inches of precipitation a year. Deserts don't necessarily have to be hot. Some of the world's largest deserts are cold deserts located at one of the Earths poles or in a cold area of the world. One thing is for sure, deserts are dry and barren places. Go here for more information on the desert habitat. This is the world's largest desert and is located at the South Pole. Basically the entire continent of Antarctica is considered a desert because it gets very little precipitation. The Arctic desert covers the North Pole. They are both called polar deserts. The Sahara Desert is the largest non-polar desert in the world. It is located in North Africa an is nearly as large as Europe or the United States. The name Sahara comes from the Arabic word for desert, sahra. Areas of the Sahara Desert look like the classic desert you see in the movies sometimes with giant sand dunes that can get over 500 feet tall! The Sahara Desert covers many countries including Egypt, Libya, Chad, Algeria, Morocco, Niger, Sudan, and Tunisia. There are oases of life in the Sahara such as the area along the Nile River in Egypt where the civilization of Ancient Egypt thrived. The Arabian Desert covers most of the Arabian Peninsula including countries such as Saudi Arabia, Iraq, Kuwait, Jordan, Qatar, Yemen, and the UAE. It is the second largest non-polar desert. The center of the Arabian Desert is one of the largest single continuous areas of sand in the world called the Rub'al-Khali. It is one of the most oil-rich places in the world. 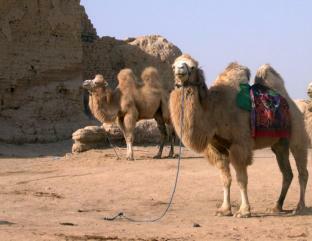 The Gobi desert is located in Northern China and Mongolia. The Gobi is known in history as part of the great Mongol Empire as well as home to some important cities along the Silk Road. The Gobi is a cold desert and is located on a high plateau making much of the desert's elevation over 3,000 feet above sea level. The Kalahari Desert is located in Southern Africa. Like many deserts, it has large temperature swings, with temperatures dropping to zero at night and then rising to above 40 degrees C (104 degrees F) in the day. The Mohave Desert is located in the Southwest of the United States. It is home to Death Valley, the hottest and lowest spot in the US. Mohave Desert means high desert and is named after the Mohave tribe of Native Americans. The nickname for the Rub'al-Khali is the Empty Quarter because there is so little there other than sand. Meerkat Manor was a television series about meerkats in the Kalahari desert. Death Valley, the lowest elevation in the US at 282 feet below sea level, is only 86 miles from Mount Whitney, the highest point in the continuous United States. About 20 percent of the world's land surface is desert. Europe is the only continent with no large deserts.